Maybe it was the snow falling outside the arena, or the the NBA trade deadline looming on Thursday afternoon. Or maybe it was a matchup with one of the NBA's worst teams. Whatever the reason, it took the Jazz nearly three quarters to get locked in before they came alive late and ran away with a 116-88 victory over the Phoenix Suns Wednesday night in Salt Lake City. 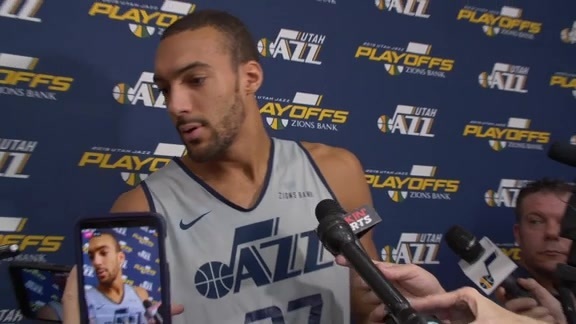 "They're a good young team and they play hard," Utah forward Joe Ingles said after the game. "We just needed to tighten up some things, which we really didn't do the first three quarters. That was a good win." It might not have been the most inspired night of baskeball, but the Jazz (31-24) still managed the lopsided victory with a total team effort. 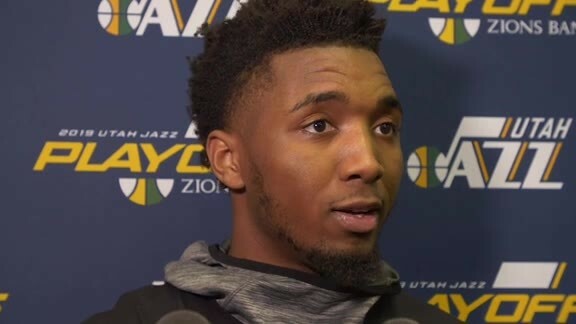 Seven Utah players scored in double figures, led by Donovan Mitchell's 21 points. 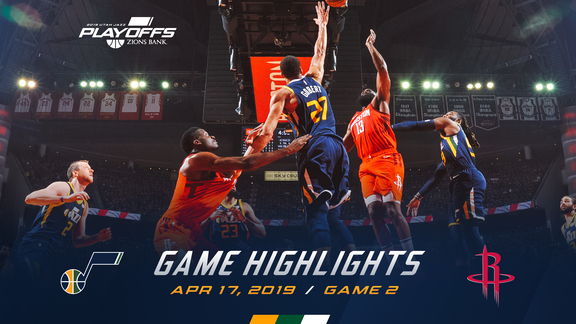 Ingles scored 15 points and tied his career high with 11 assists, while Rudy Gobert logged yet another double-double with 16 points, 12 rebounds, three steals and three blocks. 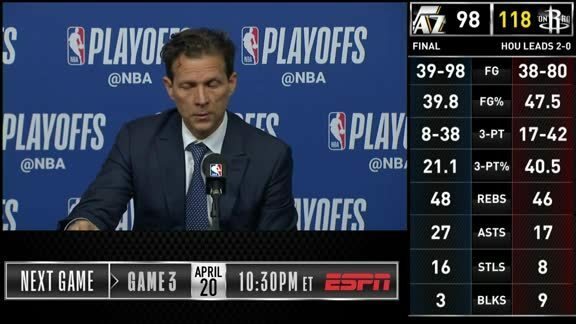 Ricky Rubio (13 points, nine rebounds, six assists, three steals), Derrick Favors (14 points, two steals, two blocks), Royce O'Neale (15 points on 5-for-6 shooting) and Jae Crowder (11 points, seven rebounds) also scored in double figures in the win. Playing without leading scorer Devin Booker (hamstring), the Suns (11-45) rolled out a starting lineup with three rookies, including No. 1 overall pick Deandre Ayton and No. 10 overall pick Mikal Bridges. Second-year wing Josh Jackson, though, led the way with 27 points, four rebounds, seven assists and five steals. Ayton finished with 20 points and nine rebounds, while Kelly Oubre Jr. added 16 points off the bench in the loss. On Utah's first possession, Mitchell juked past Bridges and then zoomed past Dragan Bender for a layup. That level of resistence—practically none—turned out to be the norm for Phoenix's defense as the Jazz jumped out to a quick 9-3 lead, with buckets by four different players (Mitchell, Ingles, Favors and Rubio). After a quick 8-0 Phoenix run and subsequent Jazz timeout, Kyle Korver and Crowder hit back-to-back threes, and then Mitchell got into the lane for a slick floater. The Jazz would lead by six at the end of the first quarter. An 11-0 run to start the second quarter—with buckets by Raul Neto, Favors, O'Neale and Mitchell—put Utah ahead by 17. The Suns, though, clawed back to within four near the end of the third quarter. Ingles responded by banking in a runner along the basline, and then he dished it to Favors for a two-handed slam off a pick-and-roll. Leading by eight heading into the fourth, Ingles found Favors for another dunk to start the final period. A steal by Rubio and three by O'Neale put the Jazz up by 13 and prompted a Phoenix timeout. Back-to-back threes by Ingles, and then a corner three by Mitchell, helped keep Utah's lead in double figures. Utah would cruise from there to the 28-point victory. Phoenix turned the ball over a lot (22 times, to be exact) and Utah converted those miscues into 19 points. 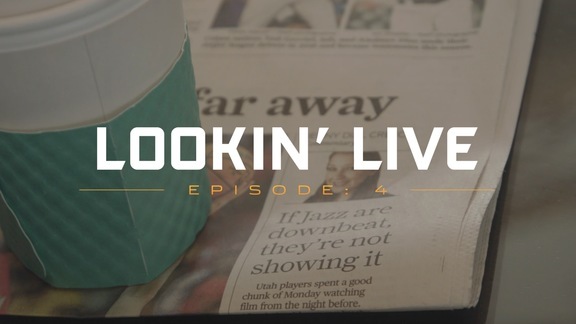 The Jazz outscored the Suns 37-17 in the fourth quarter. Utah shot 11-for-17 (64.7 percent), including 5-for-7 from beyond the arc, and 10-for-13 from the free-throw line over the final 12 minutes. "Offensively, we just settled down. Early on we made some careless plays where we weren't able to convert on some good defensive possessions. In the second half we made the extra pass and got some good looks because we were passing the ball." Phoenix head coach Igor Kokoskov returned to Utah for the first time since he was hired by the Suns over the summer. Kokoskov spent three seasons as an assistant coach for the Jazz. ... Neto (groin) returned to the court after missing Utah's last 12 games. He hit his first shot—a corner three—and finished with three assists in 12 minutes. ... Danté Exum (ankle) and Thabo Sefolosha (hamstring) remained out for the Jazz. ... Besides Booker, the Suns were also without TJ Warren (ankle) and De'Anthony Melton (ankle). ... Utah outrebounded Phoenix 43-37 ... Phoenix shot 3-for-17 from 3-point range. ... Jackson has now scored 25+ points in three straight games. The Jazz will stay at home to face the San Antonio Spurs on Saturday afternoon. Tipoff is set for 3:00pm MT.